To read the latest edition (number 6) of Revolutionary Platform News, mainly intended for distribution at the TUC conference that I started distributing copies at yesterday (Bournemouth, 8-11 September): www.facebook.com/events/210223049102033 (but I have also handed it out at the Merseyside People’s Assembly on Thursday evening and the national coordinating group of Left Unity to which I was a delegate for the first time on Saturday), go to www.revolutionaryplatformofleftunity.org/news/6.html. The newsletter has headlines “TUC: Serious coordinated strike action against cuts now! Don’t pay the national debt to bondholders after a revolution!”, “Cameron’s fracking defence demolished (economic and environmental arguments)” and “Call for a Revolutionary Platform of Left Unity”, plus details for the national demonstration (primarily against cuts and to save the National Health Service) at the Tory Party conference in Manchester on Sunday 29 September. There are links at the bottom of that page to PDF/DOC files containing black-and-white/colour versions of the newsletter as two sides of A4, which you can download for printing and possibly photocopying and distribution (but I have nearly 1,000 copies in black-and-white with me in Bournemouth – cheapestprintonline.co.uk failed to post colour versions to me despite the claims on guaranteed next day delivery on their website – beware of them if you are submitting something too radical!). This entry was posted in Economy, Environment, Poverty, Revolution, Strikes and tagged civil disobedience, coordinated strike action, fracking, Gagging Bill, general strike, hydraulic fracturing, Left Party Platform, Left Unity, lobbying, Revolutionary Platform, Revolutionary Platform News, Socialist Platform. Bookmark the permalink. I have posted below the text of the Revolutionary Platform News newsletter referred to above. This will hopefully get round WordPress censorship and enable you to read it, without the inconvenience of clicking on the above link. 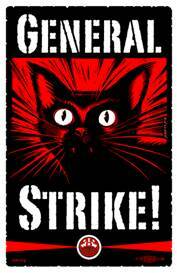 TUC: Serious coordinated strike action against cuts! Don’t pay the national debt to bondholders after a revolution! At last year’s Trades Union Congress (TUC), a motion to consider the practicalities of organising a general strike was overwhelmingly passed. Disgracefully, most of the union leaders have ignored that motion. Since then, the North West TUC AGM almost unanimously voted to support the idea of a general strike and the TUC General Council agreed to organise a meeting of union leaders who were considering strikes to coordinate action. However, most of them are out-of-touch bureaucrats holding the movement back, and this year the Congress should mobilise rank-and-file activists so that serious action takes place. Motion 3, proposed by the PCS union, section (i), calls on the General Council to “facilitate a coordinated programme of industrial action and civil disobedience involving trade unions and other campaigns”. A big vote for that motion, or a composite motion that includes that section, could have a big effect on mobilising the trade union movement for serious action. This has become more necessary than ever, now that New Labour’s leadership has said it will continue with ConDem austerity. It’s not enough to oppose the cuts – we must put across an alternative. Many left-wingers propose Keynesian solutions which wouldn’t work because the markets would wreck the economy. We mustn’t be blackmailed by them but argue for a socialist revolution. After the October 1917 revolution in Russia, the new Bolshevik government refused to pay the debts of the previous imperial regime; we should refuse to honour the “risk free” bonds/gilts making up the national debt when we replace capitalism by a democratic socialist society! An interview with “respected” (capitalist) economist Lord Stern in The Independent (4 September, tinyurl.com/frackdefence) says that he was puzzled by David Cameron’s claim in August that “fracking has real potential to drive energy bills down…gas and electric bills can go down when our home-grown energy supply goes up”. Stern argued that it is “baseless economics” since gas is a commodity that can be traded on the international market, sold to the highest bidder. Although fracking has so far brought down prices in the USA, the new liquefied natural gas (LNG) industry, shrinking gas to 1/600th of its original size, will allow gas to be easily shipped long distances to gas-hungry economies in Asia, so fracking may not bring down prices there for much longer either. It is the environmental effects that have particularly worried campaigners – including global warming, mini-earthquakes, subsidence and noise for those who live nearby (hence reduced house prices), heavy use of water, radioactive contamination, carcinogenic chemicals and particularly pollution of the water supply (which means that some people in the USA can’t even bathe in tap water never mind drink it – there were 19 cases in the town of Dimock alone which the US Environmental Protection Agency covered up, see tinyurl.com/frackdimock). Incredibly, fracking is exempt from their Safe Drinking Water and Clean Air Acts. So is it irrational for the ConDem coalition government to give the green light for fracking? Not with all the lobbyists from big business, never mind the Tories who financially benefit from such schemes. Their proposals on lobbying reforms would do less than nothing to stop corporate lobbying (a register of lobbyists would allow politicians to check if they are being set up), but threatens the ability to put pressure on the government by trade union members, socialists and campaigners like Avaaz, 38 Degrees and Friends of the Earth. I am putting out a draft statement of a proposed new platform of Left Unity (LU), called the Revolutionary Platform (RP). The idea is to unite as many genuine revolutionary socialists as possible within LU in a single platform, to try to overcome the problem which occurred with other broad socialist organisations (including the Scottish Socialist Party) of rival revolutionary organisations competing with each other within it rather than cooperating around shared goals. The Socialist Platform of LU (tinyurl.com/socplatlu) is almost a revolutionary platform, but where it says (in point 1) “Its aim is to bring about the end of capitalism and its replacement by socialism”, it fails to specify whether that can or should be achieved by revolutionary or reformist means. I’ve kept the statement deliberately short, avoiding stating the obvious – such as opposition to discrimination, sexual assault and harassment, attacks on welfare (such as the bedroom tax and council tax bills for the unemployed, dubbed “the new poll tax” by some) and organisations like the BNP and EDL. I’ve set up a Google Group to which I will add anyone who contacts me to sign the platform – this group can be used to flesh out other policies and decide on strategies for action within LU (particularly at the 28 September policy workshop conference in Manchester and the 30 November founding conference in London) and on the internet and in the outside world. To sign this statement or discuss it, phone/text me on 07725 735255, telling me your name and email address (which need to be ones you have signed Ken Loach’s appeal with at http://www.leftunity.org/appeal). We need 10 members to become an official platform with the ability to put forward motions at the November conference. 1. By revolutionary, we mean sudden thorough change, preferably through peaceful means like a general strike. Gradual reformist (e.g. Keynesian) change won’t lead to socialism because gains that can be won during a boom are taken back in a slump or recession. 2. We know that we won’t be in a majority within Left Unity in the short or probably even medium term, but think it useful for revolutionary socialists to unite together in a single platform to discuss how to ensure that a socialist revolution happens. 3. Involvement in the Revolutionary Platform would not preclude involvement in other platforms – we recognise that there are many things we would agree with in the Socialist Platform (tinyurl.com/socplatlu) and Class Struggle Platform (tinyurl.com/csplatlu). 4. The Left Party Platform (tinyurl.com/lpplatlu) says little that is contentious, and is based on lowest common denominator politics, which has already been tried in the Socialist Alliance and Respect with unspectacular results – except in areas where well-known candidates, particularly Dave Nellist and George Galloway, have stood, and we believe they could have done equally well on a more revolutionary programme. 5. Adopting a radical programme, such as that proposed by the RP, SP or CSP, should not exclude less radical left-wing activists (particularly if they identify themselves as socialists) from involvement in LU. A broad socialist organisation like LU already does welcome debate and different points of view on its website and forum, and will (surely) continue to do so. 6. Socialism must be democratic – we reject the idea that the regimes in the USSR, Eastern Europe and China were socialist, but we believe in unity between revolutionaries who called such regimes “deformed workers’ states”, “state capitalist”, “bureaucratic collectivist” or simply “Stalinist”. 7. Socialism has to be international, particularly in this globalised world. We reject the idea that there is a national solution to the problems of capitalism. Against cuts, to save the NHS, and to campaign on any issue that interests you! This edition of the newsletter is available in colour, black-and-white or mixed (front page colour) versions, in both Micro$oft Word and PDF (suitable for Adobe Acrobat) formats, for printing out and photocopying. Note that the Revolutionary Platform News heading uses a fairly obscure font which is not recognised by Word on some computers, so PDF format is recommended. Colour – PDF and Word formats. Black-and-white – PDF and Word formats. Mixed – PDF and Word formats.